Canada is a prosperous country, yet in 2015 roughly 1 in 8 Canadians lived in poverty. The vision of Opportunity for All – Canada's First Poverty Reduction Strategy is a Canada without poverty, because we all suffer when our fellow citizens are left behind. We are all in this together, from governments, to community organizations, to the private sector, to all Canadians who are working hard each and every day to provide for themselves and their families. For the first time in Canada's history, the Strategy sets an official measure of income poverty: Canada's Official Poverty Line, based on the cost of a basket of goods and services that individuals and families require to meet their basic needs and achieve a modest standard of living in communities across the country. 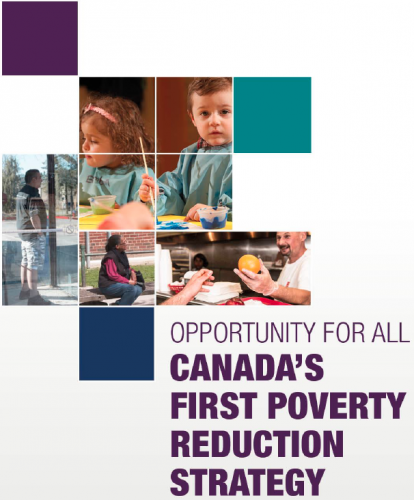 Opportunity for All sets, for the first time, ambitious and concrete poverty reduction targets: a 20 % reduction in poverty by 2020 and a 50 % reduction in poverty by 2030, which, relative to 2015 levels, will lead to the lowest poverty rate in Canada's history. A National Advisory Council on Poverty will advise the Minister of Families, Children and Social Development on poverty reduction and will publicly report, in each year, on the progress that has been made toward poverty reduction. The Government also proposes to introduce the first Poverty Reduction Act in Parliament in Canada’s history. This Act would entrench the targets, Canada's Official Poverty Line, and the Advisory Council into legislation.